It looks as if Britain’s unofficial Christmas tree dumping campaign has begun. It’s not a pretty sight, and an unnecessary one too, as Christmas trees can, of course, be recycled. Run through a shredder, they’re a great addition to a compost heap, and most councils offer a Christmas tree collection service these days. So why are so many of the eight million Christmas trees that we buy every year (250 million tonnes according to recycling experts WRAP) simply thrown away? One possible reason is that people don’t realise that Christmas trees can be recycled. Personally, I find this difficult to believe. We’re all well versed in the ‘reduce, reuse, recycle’ mantra these days. A Christmas tree is ‘green waste’ – just like shrub prunings, grass clippings and veg peelings – and therefore suitable for our green waste or compost bins. Most councils these days are pretty good at spreading the message about how to recycle your Christmas tree. A quick trawl of local authority websites reveals that most offer a recycling service – even if some ask that householders take trees to their nearest recycling centre. Even in London, which isn’t the easiest city in which to recycle, it’s relatively simple. 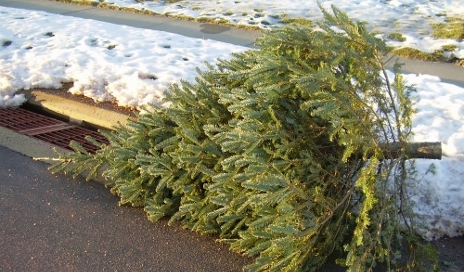 According to Recycle for London all 33 boroughs are offering Christmas tree recycling this year. Even the 20m Norwegian spruce in Trafalgar Square has been chipped and made into mulch! Is apathy, not ignorance, stopping people? My local council is asking residents to put their trees straight into their green bin. I only have a smallish green waste bag though, so I had to get handy with a saw and chop my tree into small pieces. I could also have taken my tree to my local garden centre, and if I’d been feeling really lazy, asked them to collect it for a small fee. It wouldn’t have occurred to me to just throw it away. It appears, though, that plenty of people are happy to dump their tree. Could it be that it’s not ignorance that’s stopping people from recycling, but apathy? Are the people who dump Christmas trees the same as those who dump unwanted fridges and sofas in the street? Or those who still throw paper and glass into a bin? But what you want to stop people doing is putting the Xmas tree in/on the car and making a special journey to recycle it ! Here in Sheffield the council makes it so difficult to recycle ‘compostible’ waste (they call it “garden refuse”) that I am sure a great many people leave trees fly-tipped on streets or, more often, sat outside their front windows until July simply because they are either unable or unwilling to take the tree to one of the dumpit sites where the council will, usually ungraciously, accept it for recycling. We only have green plastic sacks for this type of waste and they are only collected after you ring to have them fetched. Even then, if the sacks contain big branches the bin-men won’t take them, if they are heavy (usually due to being left out for up to 3 weeks until the collection lorry arrives and getting filled with rain water) the bin men won’t take them and if the ‘compost police’ suspect that you might have got a small pebble or a bit of loose soil in there, they won’t take them. I generally shred all my garden waste and if I really don’t have any room for the shreddings in the garden or on the allotment I put them into the green sacks, but guess what, I have now been told that I must not do that and that shredded waste won;y be taken: apparently it makes the sacks too difficult to empty into the lorry without spillage! I’m sure Sheffield is not the worst area of the entire UK for recycling so I’d hazard a guess that this sort of red tape and nonsense may be a significant factor in the issue of tree recycling? Here in London – My council does recycle garden waste – and that includes Christmas Trees- because most gardens are not large enough to have compost heaps. But Xmas trees are often left in the road because people now don’t want to leave it in their garden for the council to collect. Interesting 15 years ago there was not a problem – Now our ethic mix has changed dramatically. You may still have the problem of the binmen not collecting something unless it is “in their face”. Then if you’re on a fortnightly collection you’ll have to trip over it for another fortnight. I actually think the Councils are offering to do too much. If you can get a Christmas tree home then you should also go through the tradition of dragging it to the local park with the kids at the weekend for chipping. Why not have the machine there if you can do it safely – or at least show what is happening. Engage people’s brains. Magicking away people’s waste is bad for their health.